In 2011 I opened two investment accounts: ARM Discovery Fund and Stanbic IBTC Nigerian Equity Fund accounts. They are both mutual funds -- meaning they pool money from different individual and institutional investors and invest on their behalves charging management fee and, what is called, front-end load fee. If you are just starting your investment journey or don't have time to manage your investments yourself, mutual funds could be great for you. Since I became very busy building my career and business, I have gradually moved all my investments from being partly personally managed to mutual funds. 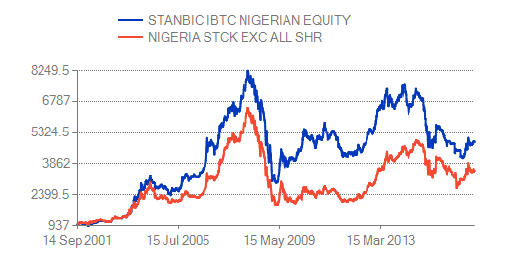 Today, I will be sharing with you an in-depth analysis of Stanbic IBTC Nigerian Equity Fund (SINEF). The fund started on 28th February 1997 and is the largest of its kind in Nigeria. It invests a minimum of 75% of its assets in stocks of companies listed on the Nigerian Stock Exchange and a maximum of 25% in fixed income (bonds and money market). This means it can have as high as 100% (which is all of its assets) invested in the stock markets if it deems it right, and when it's trying to avoid the stock market it cannot go below 75%. According to today's data from Bloomberg, its top stock holdings as percentage of total assets are Dangote Cement (8.98%), Nestle (8.78%), UACN (8.09%), Nigerian Breweries (6.73%) and Zenith Bank (5.84%). It charges a management fee of 0.63% and a front-end charge of 5.25%. Over the last 15 years it has cumulatively returned about 300%. It has also managed to beat the Nigeria All Share Index in the same period. 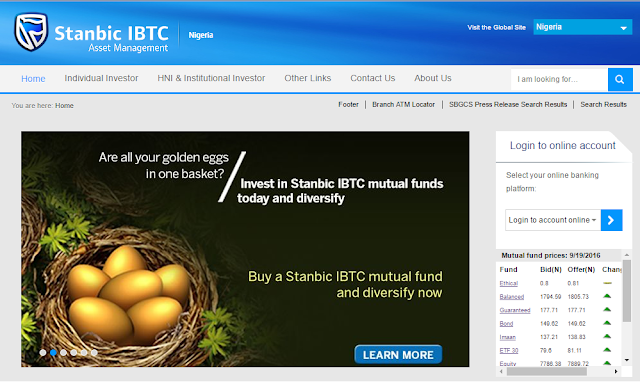 To invest in the fund, you can go to any Stanbic IBTC bank branch. The minimum initial investment amount is N50,000 and subsequent investments can be as low as N20,000.